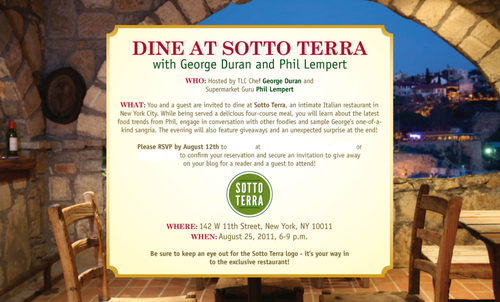 We would like to invite you to an exclusive underground restaurant, Sotto Terra, with George Duran and Phil Lempert in New York City – only open from August 23-27, 2011. Please see the attached invitation for details – we hope you join us! We did not attend, but several New York-based food bloggers did, and some offered giveaways on their blogs for readers to attend as well. Though some knew there would be a catch -- there's no such thing as a free meal, after all -- diners remained optimistic about the meal. None of them were expecting a four-course meal of frozen box meals from ConAgra-owned brand Marie Callender's, with cameras filming diners' reactions. What seems like a ploy similar to Pizza Hut's hidden camera pasta commercials may have backfired though. Many of the attendees have written blog posts summarizing the event, saying they felt irked and hoodwinked. 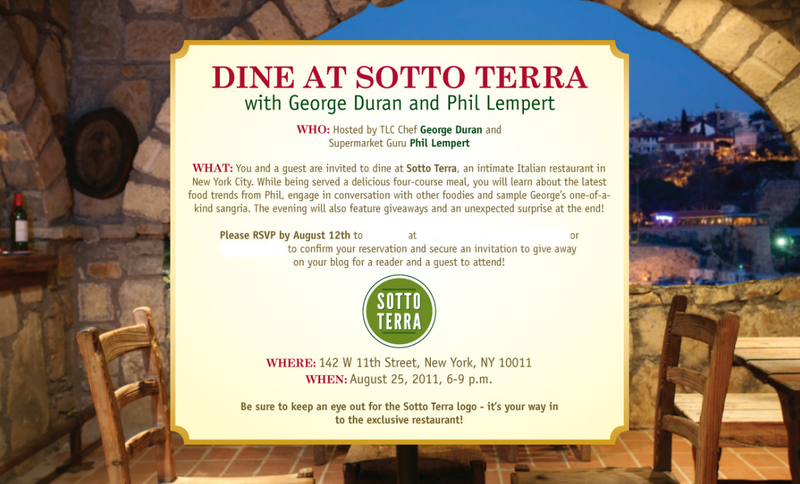 Several have pointed out the irony that conversations before the meal with George Duran and Phil Lempert discussed eating better and healthier...but then what they ate was the opposite. Stephanie Moritz, senior director of public relations and social media at ConAgra told the New York Times that ConAgra hoped to use the footage for videos on YouTube on on its website, and for bloggers to generate buzz about being "pleasantly surprised" about what they ate. Chubby Chinese Girl: "They were too confident about their products or just didn't believe in our palates and tastebuds. To make it even worse, a "giveway" that sounded like lavish dinner for my readers wasn't a classy move either. If I accept an invite and it turns out bad, that's fine, it was mine time, I can live with that. But having me promote it and then give my readers/winners frozen food isn't called for." Mom Confessionals: "Our entire meal was a SHAM! We were unwilling participants in a bait-and-switch for Marie Callender’s new frozen three cheese lasagna and there were cameras watching our reactions. I’ve got a sense of humor so I was okay with it and I had been enjoying myself up until that point, but I could tell that the rest of the participants were not. Everyone feigned weak shock and faked approval of the frozen meal. My guests were eager to leave all of a sudden and refused to sign the release." Food Mayhem: "I told you first hand of our focus on wholesome food, particularly with our baby in tow. We both said to you, with 20+ witnesses and apparently hidden cameras, how much we despise over-processed foods and artificial ingredients. We discussed with the group the sad state of chemical-filled foods and discussed various chains. And yet, you still fed me the exact thing I said I did not want to eat." The blog Brand Noise wrote that the event "broke every basic social media and research rule." Moritz told the Times, “It was never our intention to put any bloggers or their guests in an uncomfortable position and for that we are sorry.” ConAgra has offered to reimburse attendees for expenses such as cab fare and babysitting.